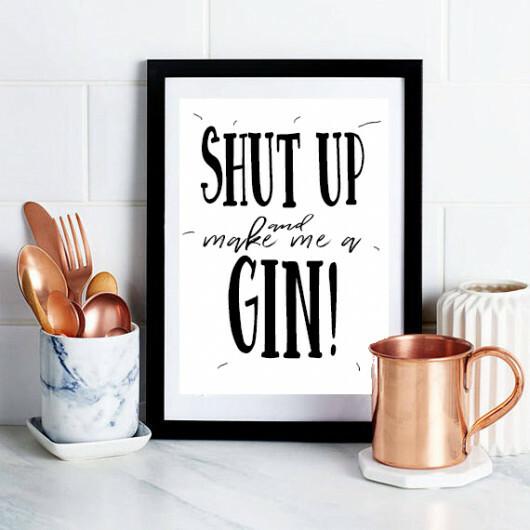 Gorgeous, contemporary, monochrome print perfect for any modern kitchen and lover of gin! This lovely print, is stunning and is a quirky, modern, fun statement piece for any kitchen. The print comes unframed as standard but you can choose for the A4 size print to be framed with either a white or black frame.The A4 print when framed is framed within either a black and white frame in a frame that measures 30 x 40 cms, giving a beautiful framed larger size. Please note that the frame has an acrylic as opposed to glass front for safety. Print is A4 and then sits within the mount of the frame if the frame is chosen at checkout. The frame itself is an A3 frame.